I almost named this post Personal Lasagna. With a title like that, how can you go wrong. 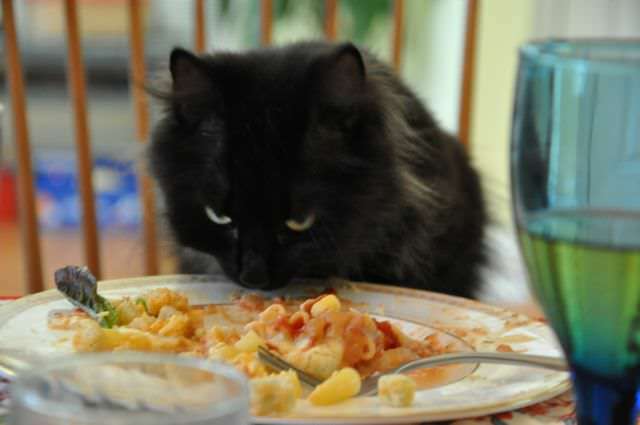 Your own personal lasagna. Sounds so much classier then a personal pan pizza, and yet so much less expensive then a personal shopper. 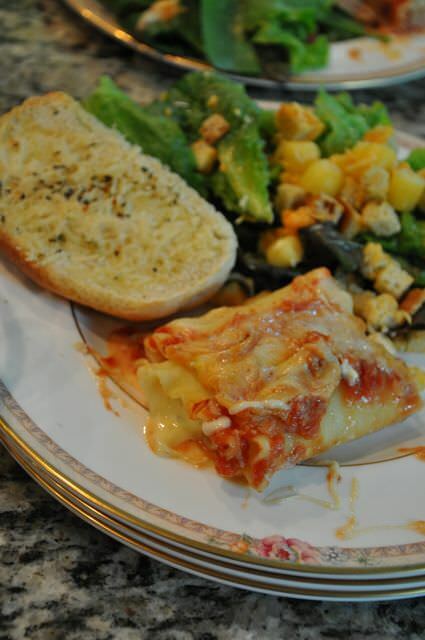 A personal lasagna, ready to be slapped on a plate next to a salad and garlic bread, ready to be eaten. 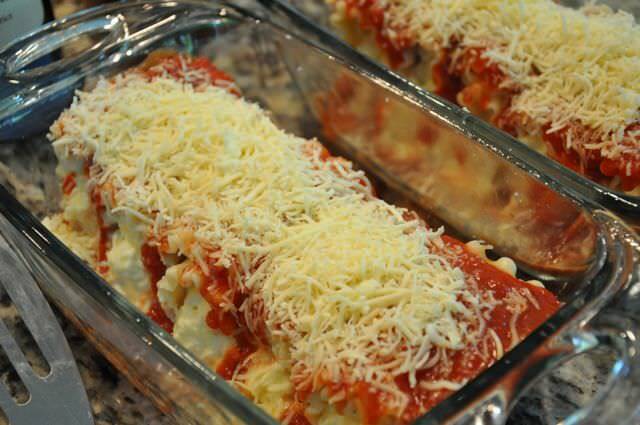 But I switched it to Manicotti Hack, because that’s how I invented these. 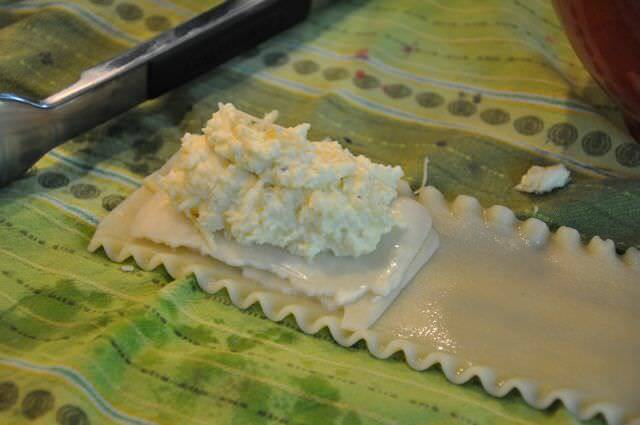 After a few failed attempts at filling a manicotti… completely breaking the noodle and heating up the kitchen with a few choice words, I decided to try a new tactic. And that is when inspiration hit. Why use an over-sized spoon to try to fill (read: destroy) a pre-made tube of noodle when I can roll a flat one up instead! Easy, peasy. 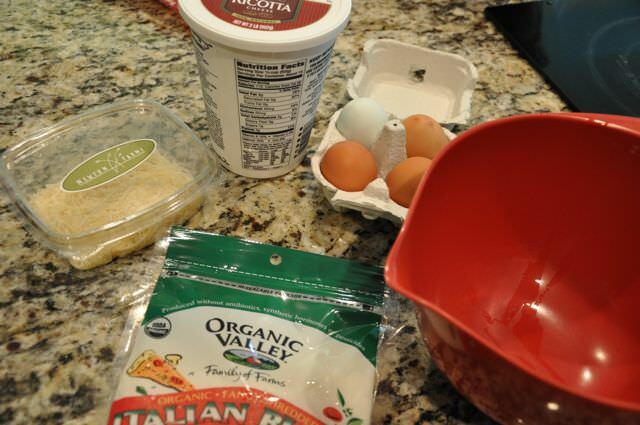 Try my recipe out, you’ll be so glad you did. I tend to make my lasagna taste more like pizza to please my kids… feel free to *adult* it up with fancier ingredients at your discretion. The best part about this recipe is that you no longer have to wait 10 minutes for your lasagna to set before you slice it, nor do you have to smash your spatula down in utter irritation when you serve the lasagna and it doesn’t stay perfectly stacked. Yours slides off to the side too, doesn’t it? I hope I’m not the only one who winds up serving my lasagna in a bowl with a spoon. These are ready to plunk down individually the moment they come out of the oven. Yum. garlic powder , basil, and other dried Italian herbs, to taste. 1. 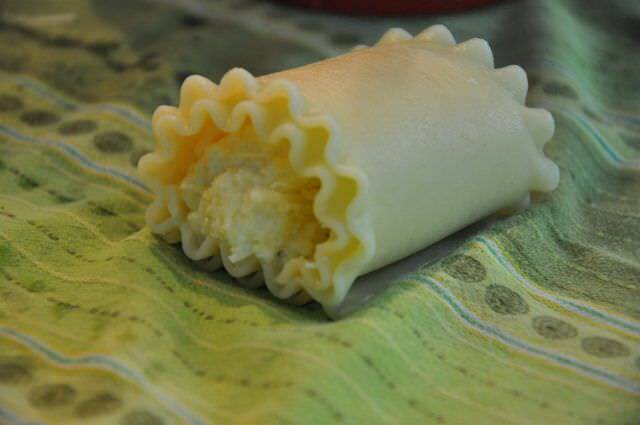 Cook the lasagna noodles until done. Not falling apart, but done. They do not continue to cook in the oven. 2. While the noodles boil, mix the ricotta cheese, 1 1/2 C mozzarella, 1/2 C parm cheese, 2 eggs and any dried herbs you’d like in a bowl. 3. Once cooked, use tongs to take out one noodle at a time and pat it dry on a non-terrycloth dish towel. 4. 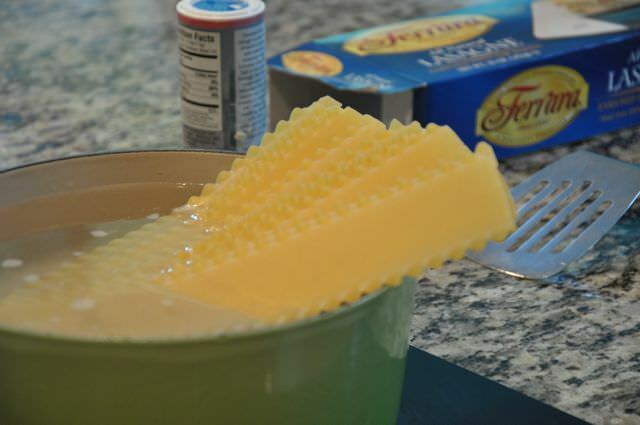 Put a half a slice of mozzarella cheese at one end, plunk a heaping dollop of cheese mixture on top of that, and roll up! … then just roll it up! 6. Continue until all the noodles and all the filling are used up. 7. 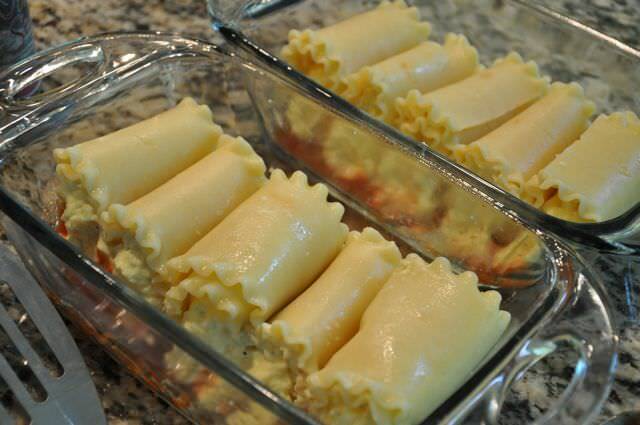 Pour the jar of sauce over the noodles, sprinkle the last 1/2 C of Mozzarella on top, then slip it into the oven. 8. Bake for 25 minutes, until hot and bubbling. Meanwhile, make your salad and garlic bread. If you have a garden, now’s your chance to head out and pick some veggies for your salad! 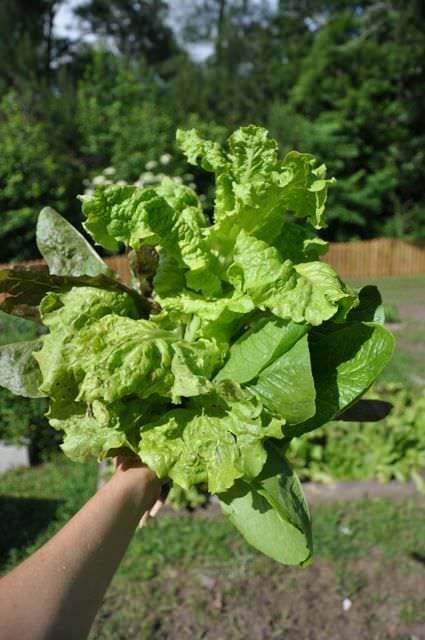 For some reason, the lettuce has really taken off in my garden, and it is so lovely! I just have to share — isn’t this *almost* as pretty as a bouquet of flowers? 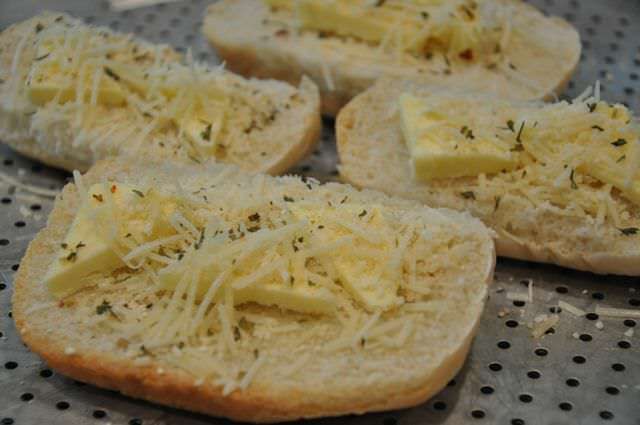 Do you this much butter on your garlic bread too? Pop one or two personal lasagnas onto the center of each plate, and stand back and admire how low your blood pressure is and how perfectly rolled up the personal lasagnas remain. It’s lovely. I just had my dearest childhood friend come in for a quick visit. It was too short but then again, it was just right. She’s the kind of gal that I can go for a year or two without seeing, and my connection to her never changes one speck. I get really attached to people. I will love my husband always and forever, and no other man. I will love and adore my children beyond measure forever, and never can anyone ever compare to them in my eyes. My family is now my *one thing*, the one thing I need in this world. I can do without anything else on this earth but those three souls. I’ve always been like that. I had one best friend growing up, and that’s all I ever really needed or wanted. I met this fabulous human being when I was only 5 years old… that’s 31 years ago now. 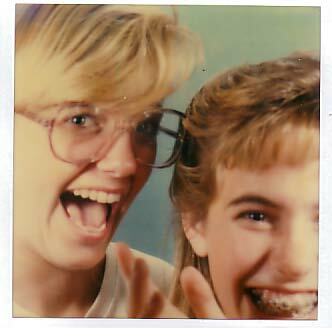 She was my best friend all through the rambunctious silly childhood years, all through the awkward pre-teen years, all through the tumultuous teenage years, all through my evolving college and med school years…. really, until my husband became my soul mate. And even now, she is someone that I will always treasure. Because I’ll never have that kind of one-on-one amazing friendship ever again as an adult. My family is my one thing, and I like it that way. The amount I have left over for friends has changed. Once I became a Mommy, everything past my kids became secondary. And not only that, but friendships became much more communal, which is a good thing. Playdates expanded to include entire families, social circles evolved, neighbors, artist gatherings, patients and customers — they all have special spots in my heart and I’m a richer, more balanced person for having this wider social network. I wouldn’t change it for the world. It’s just what I need as a mother and an artist and a woman. But. There is just no denying that, for me, I really did love having one, lifelong friendship. If any of you have ever had one amazing best friend, you know just what I mean. I didn’t have to wonder who I was going to go trick or treating with every year, who I’d sit with at lunch every day, who I wanted to hang out with after school. Who I’d give a ride to my very first time driving a car. Who I’d have spend the night on my birthday. Who I wanted to see most on the first day of school. Who I wanted to figure out growing up with… hairstyles, make up, bras, periods, boyfriends. My friend of over 3 decades… I love knowing that when I’m 80 years old, I will have known you for 75 years. 94% of my life. If that’s not special, I don’t know what is. I’ve known for quite a long time that my daughter is extremely skilled at drawing. She could draw animals and people with details like facial features and horns and beaks and tails when she was just one and a half years old. I had an acquaintance tell me right to my face that this was impossible at age one, the brain couldn’t handle it. My daughter’s brain can. Simple as that. I tell you, I could sell this on my Etsy shop for hundreds of dollars! But it would take millions to get me to actually agree to the sale…. and even then… I’m not sure I could actually send it off. No, I know I couldn’t. I love this pitcher so damn much. How unique is she! This is the one of the many blessings of free learning, unschooling with kids. They are unlimited in their creativity. A wonderful unschooling friend of mine shared this quote: “A child in school studies art so that one day they can be an artist. 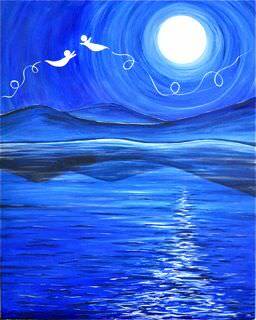 An unschooled child says, “I am an artist,” and so they create.” Simple as that. 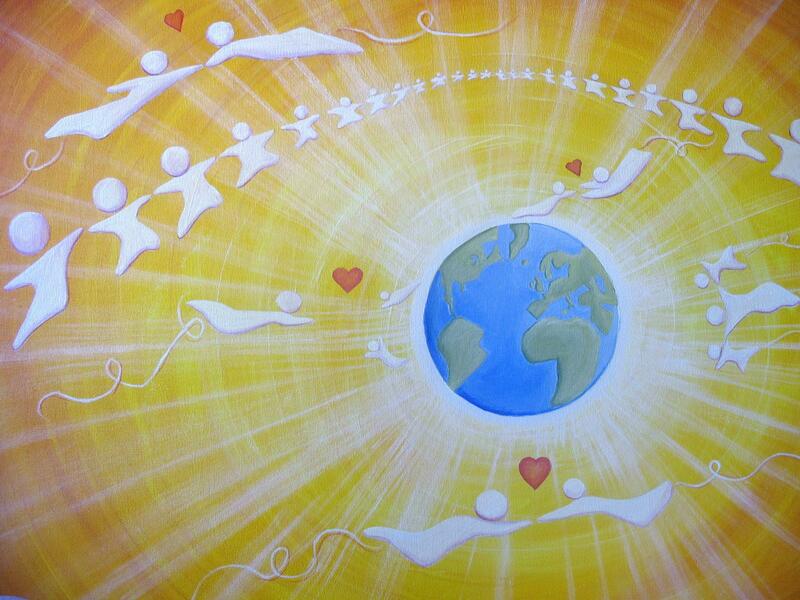 My goal each day is to find my heartsong… something that makes my heart sing out loud. 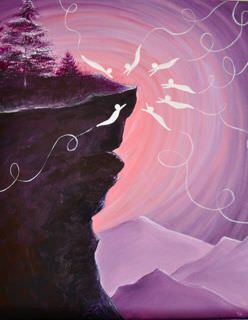 So it’s not surprising that I’ve been a bit obsessed with birds lately. We have 8 as pets. And they pop up all the time in my paintings. 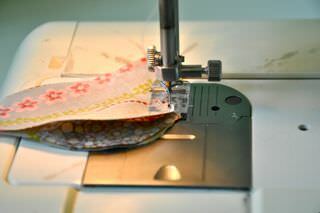 And my sewing. 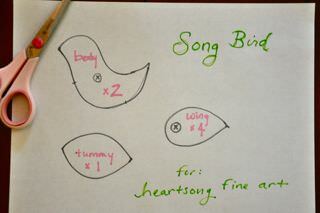 Chirpy little songbirds… I can’t get enough. So I am here today to share them with you. 1. 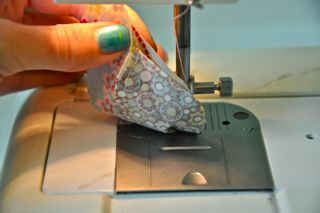 This is the hardest part of the tutorial, because I don’t really use a pattern. I’ve drawn for you roughly what the pieces look like… they really don’t need to be perfect, because you trim anything that is uneven or doesn’t match up… and you really can’t get the proportions wrong. 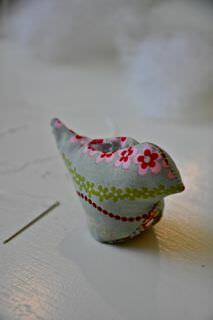 You just use this as your guide… you can make a huge bird or a tiny one… go for it and have fun. Cut out 1 tummy piece, two body pieces, four wing pieces (I like to mix and match fabrics… this is a great scraps buster) and two *more* wing shapes out of felt. 3. Now go ahead and cut a bunch more while you are at it, because these birds don’t take long to whip up and I bet you can make these faster then you think you can! 5. Here is the best part. 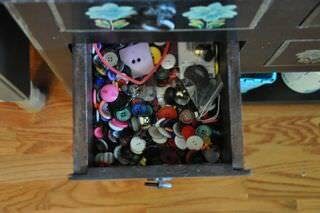 Do you have an old stash of buttons? Make a cup of tea, spill them out on the floor, and have fun daydreaming and sorting through them. 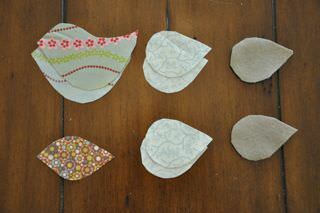 Pick out two buttons for each bird. This will be the longest part of the tutorial, I promise. 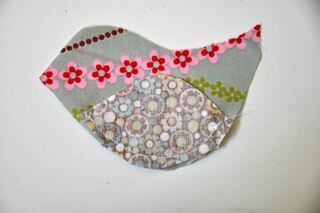 You’ll sew the rest of this bird more quickly then you will have picked out it’s button color. 6. Line up one edge of the tummy piece on top of one of the body pieces… right sides together. 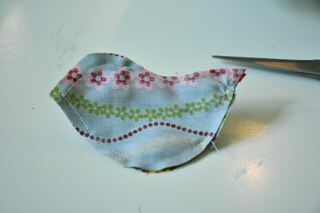 Stitch along the bottom curve, just the the length of the tummy piece, as shown. 7. Place the second body piece, right sides together, on top of the original body piece. 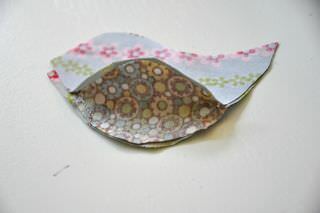 Fold the tummy piece open so that the open end of the tummy piece lines up with the new body piece… as shown. 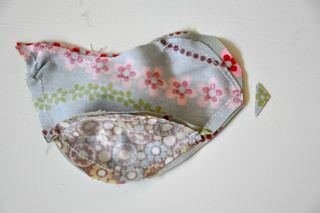 …now lay it back down and sew the tummy, continuing on up around the head. Leave a gap for flipping the bird… wait! Did I really just say that? Well, at this point, I bet you feel like flipping *me* the bird, but wait. You’ll like me again by the end, when your bird is staring back at you, demanding that you be nice. 10. I cut off the extra fabric at the beak and tail points, but that’s about the only contour work I do. If you want to snip the curves… have at it! 11. 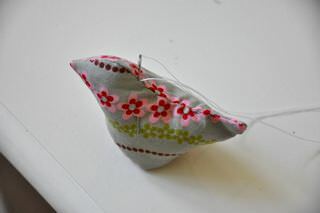 Now turn the bird right-side-out, stuff as you please with filling, and hand stitch the small opening in the back closed. You are almost there! 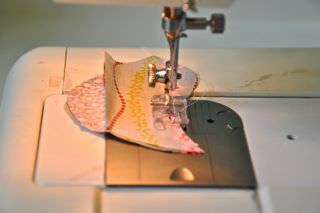 I usually leave the thread attached and come out about where I want one of the wings to attach. 13. 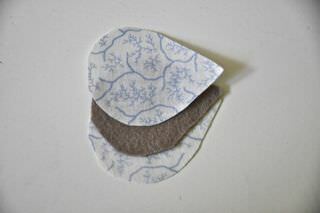 Sew around the outer edge, then trim the excess off, leaving a cute raw edge, with a peek of the contrasting felt visible. Notice how the wing curls slightly, I like to enhance that curl by rolling it up for a moment, and then when I sew the wings on, I like them to be curling away from the body on each side… so cute! 15. 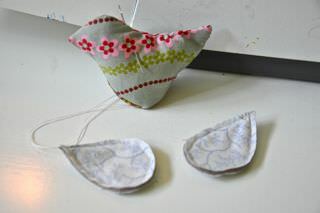 All that is left is for you to sew the wings on! Yippee! 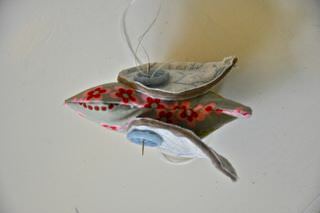 Just sew one wing on (along with it’s button) and go through the bird to sew on the other wing. Tie a knot and bury the end of the thread in the body of the bird. 16. Yea! You made it! Your bird is so proud of you! And I am too. As long as you didn’t actually flip me the bird while making it. You can perch this bird on anything you can think of. 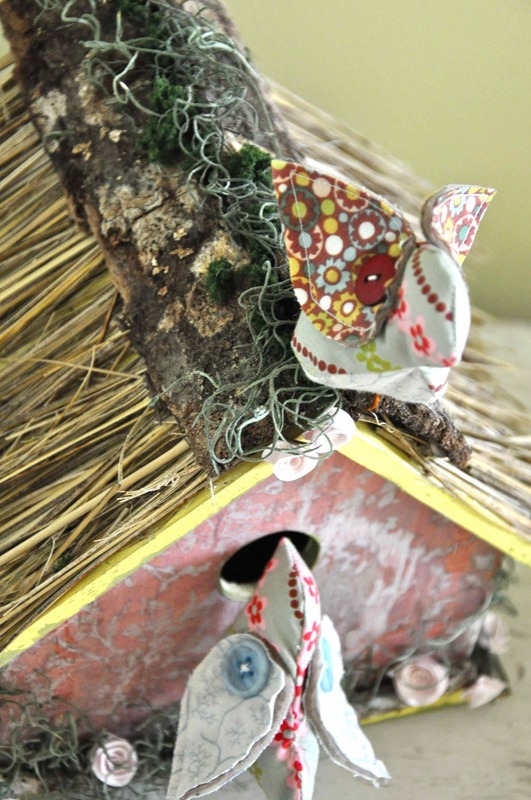 These particular birds were used in my shop on birdhouses and a wall organizer. 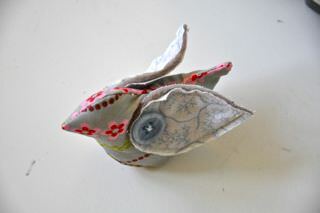 If you didn’t make it through, and you would rather have me make you one, just visit my shop! I guess I am officially a house wife. Why does this annoy me as much as it thrills me? It really does. I hate that I love the sight of laundry hanging on the line. It seems like it should be oppressive… degrading… at the very least, unfair that I’m doing laundry while my hubby finds fulfillment at work… changing patient’s lives, chatting with his lovely office staff, getting to be the boss of something larger then the chores. And most chores are like that. 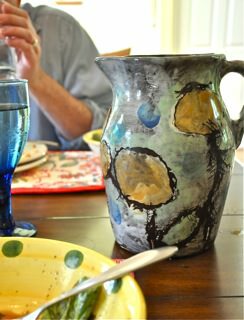 My husband comes home in the afternoon and we talk about our day… his seems so fulfilling, helping patients towards health, while I’ve scrubbed a toilet. But laundry that actually makes it out to the line is different. Not the sopping wet stuff I cram into the dryer and forget. But the loads that I take the time to carry out onto the back porch and hang… those just make my day. And today I finally figured out why. It’s not about the laundry. It’s about the sunshine out there, smiling on all my favorite memories. It’s like the sun agrees with me that my family is awesome… and is lending me her warmth to help out… giving a big thumbs up to all that I cherish. 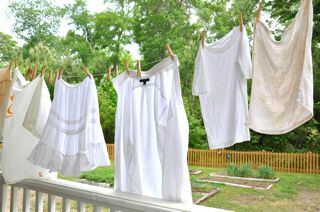 Why do I love laundry in the sun? I have as many reasons as I have articles of clothes hanging on the line. 1. My red-headed, freckle faced husband that wears a rash guard in the sun, reminding me of our recent trip to the beach. 2. Me enjoying my girly side… it used to be short mini skirts that made me feel like a girl… now in my 30’s it a fluffy petticoat handmade from England that I got off of Etsy. 3. A crisp white work shirt that hubby wears to work… rolled up at the sleeves and with his tie thrown off at the end of the day, he makes our house a home. 4. My son’s white pj t-shirt, which (even though he is only 6) is almost as big as my shirts… makes me giggle out loud. 5. A dish towel, that I’m hoping the sun can bleach white again… stained up by countless pets and meals and art projects. Everything always works out for us. We say that out loud to each other almost every day. I know I say that to myself, and really *feel* it, multiple times a day. I was just saying it to myself today and I realized… this must be our family motto. It made me stop and realize how far we’ve come, and wonder how this became our motto. Only a few short years ago this wasn’t a thought that would routinely cross my mind. I felt blessed, no doubt. I felt joy at being a mother and a wife, absolutely. I adored my children to the point of utter obsession. It was hard to breath, it just took my breath away. But although I was often grateful, I don’t think I lived *in gratitude*. I had my bad days like everyone else… we had our large financial debts from medical school and credit cards, I was having trouble deciding if I should go back to work as a physician, growing pains at identifying myself as a stay at home mother, trying to settle into my style of homeschooling, having two (wonderful!) young children was physically exhausting, no room for the type of painting and crafting and expanding that I wanted to do… and *who am I? * and *where am I going? * were constant questions that pressed on my heart. I didn’t wait for everything to start always working out for us before I started to *feel* like everything was always working out for us. In other words, I did not wait for circumstances to change, but I changed in my heart first. 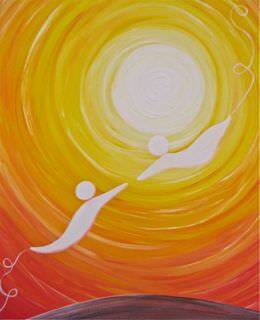 Every single thing that happened to us, we started to see in the best light possible. I refused to do anything that didn’t feel right. 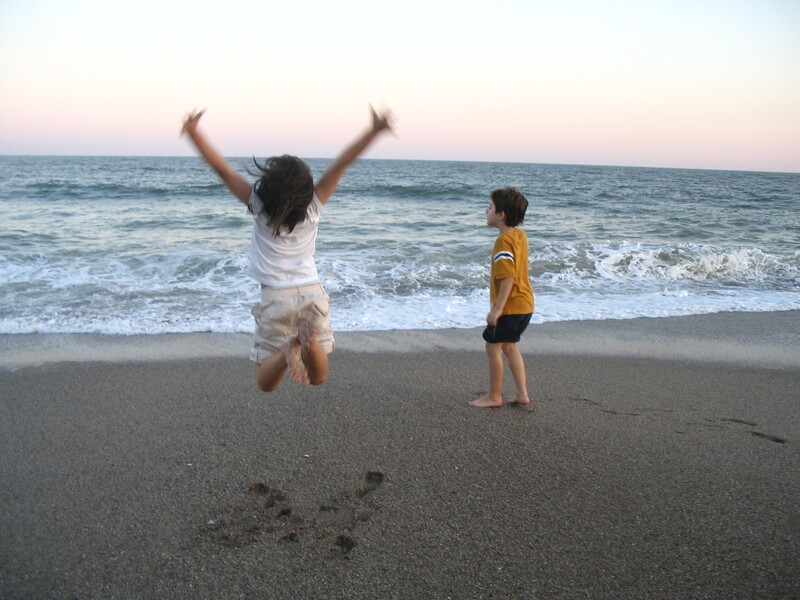 Homeschooling became unschooling, and gave our family the feeling of expansion I was searching for. Every day *problems* became opportunities to be grateful for how they resolved. I started painting my home funky colors that felt right to *me* — a neon green play room, a bright orange living room, a purple dining room with a huge mural of a tree, a blue ceiling with stars painted on it… I just went for it and didn’t worry about controlling outcomes any more. And I noticed that the less I tried to control outcomes, the more lovely the outcomes became. Since I no longer was limited to what I thought I *wanted*, I became more open to possiblities. I know that there are no rules and no limits. Any attempt I put on my life to define what would make me happy now simply limits the outcomes. I love that every single time I have been open to it, my expectations have been blown out of the water by the reality of life. The house I *thought* I wanted to move into before? I’m in a dream home now I could never have even hoped for before. The art that I’ve been wanting a to create? I’m so glad I didn’t just limit myself to painting privately in a closet. 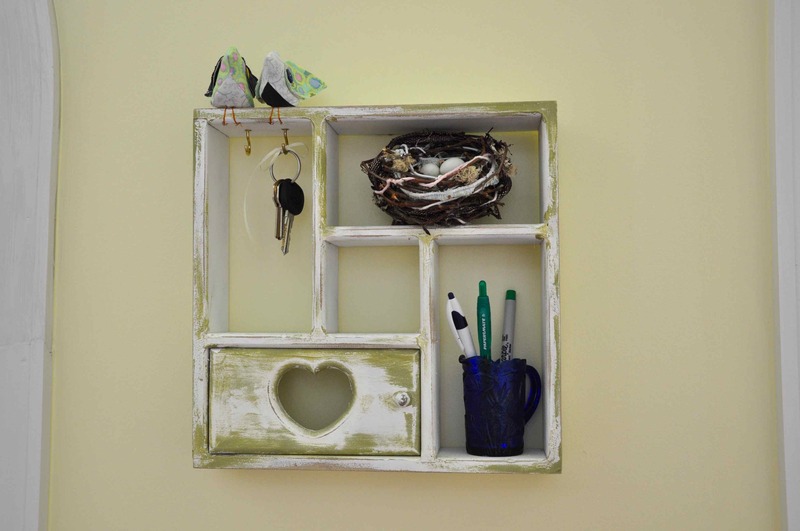 I’m now painting and selling my artwork internationally (a fact that just blows my mind every time I realize it), creating organic crafts from natural and upcycled items (didn’t see that one coming! I just get a vision and in an instant… there it is! I know better know then to hesitate… now I plunge right in and make it!) and am illustrating my first two childrens books. A few years ago, I never would have had the room in my mind to accept those gifts. 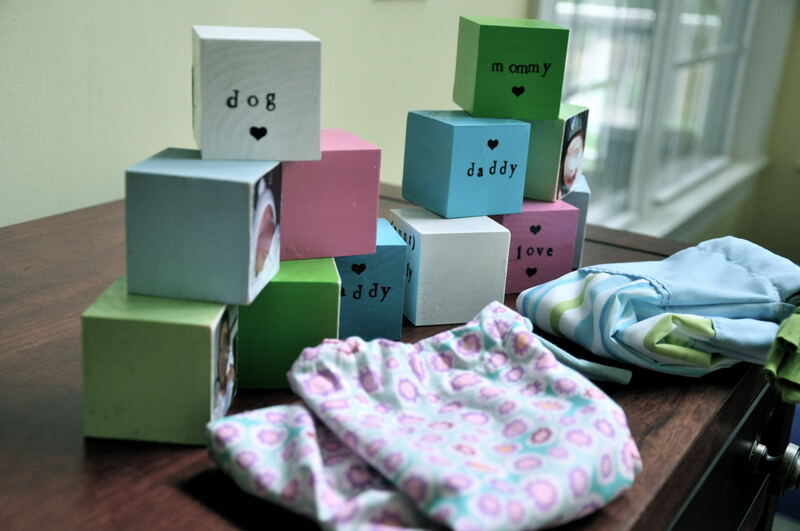 Photo blocks… crafting something I wish I had crafted for my own kids when they were babies! In a few weeks, I’ll be traveling up north to visit two of the cutest babies alive, my niece and nephew. Well, I finally realized that that is what nieces and nephews are for! The next best thing to crafting for your own child! So, in a sudden brainstorm, I decided to combine making photo blocks with this awesome tutorial by MADE for a hobo sack to give them in. 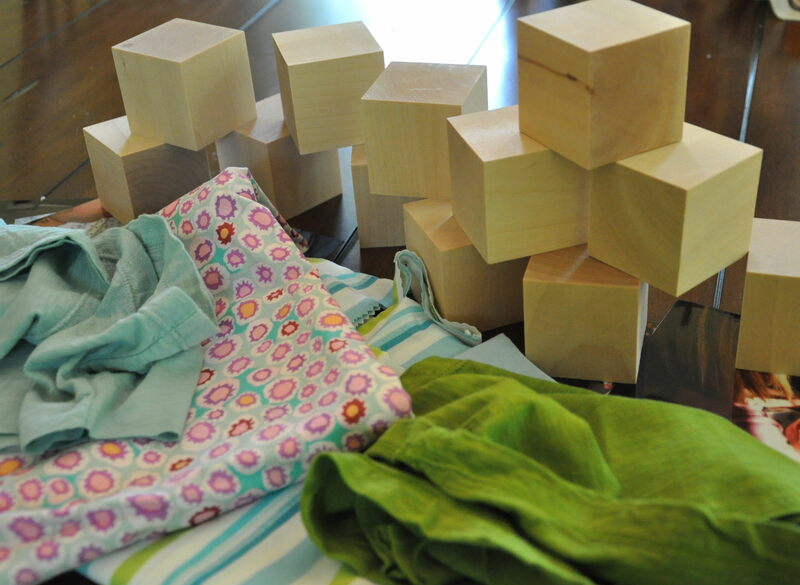 Here are the raw materials… some wooden blocks, photographs, and cute cotton prints… let’s see what I can do! If you are wanting to make your own set of photo blocks, follow along! I apologize that I don’t have more pictures of the process… I didn’t think until afterwards that I would make a post about it. But! You don’t need pictures… I give you something more valuable! LINKS! Links to other peoples tutorials!!! 1. Purchase wood blocks from Casey’s Wood… an awesome on-line raw wood resource. I got the biggest blocks possible in solid wood (so that they were not a chocking hazard for babies) and made 6 for each child. 2. Paint each block any color… I used 6 different colors and sanded each block lightly down prior to painting. After the blocks were dry, I cut a picture for each block. All you do is put the block over the portion of the picture you like, trace around the edges with permanent marker, and cut that square out. 3. 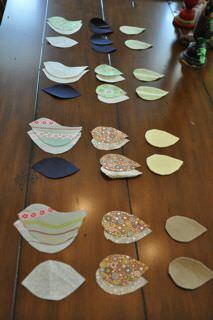 I then glued the pics on one side of each block using Modge Podge, a non-toxic glue and sealant. 4. After letting the pictures dry, I sanded the edges down again, to give a distressed, shabby chic feel to the blocks, and also to further round the edges for safety. 6. Then, making sure to blow all the sawdust away, I painted a thick layer of Modge Podge over the entire block — all of the blocks — to seal in the color and the picture. It will look white when you paint it on over the picture, and you’ll freak out a bit, but then it dries completely clear. 7. Let your blocks dry completely. Here are some links to other photo block tutorials… they all have their own modifications. This one uses rub on letters and much smaller blocks, making them (in my mind) non-child friendly, but awesome for decorative purposes. This one uses the same technique as I do, but makes them into plaques that you can hang! Awesome! 8. 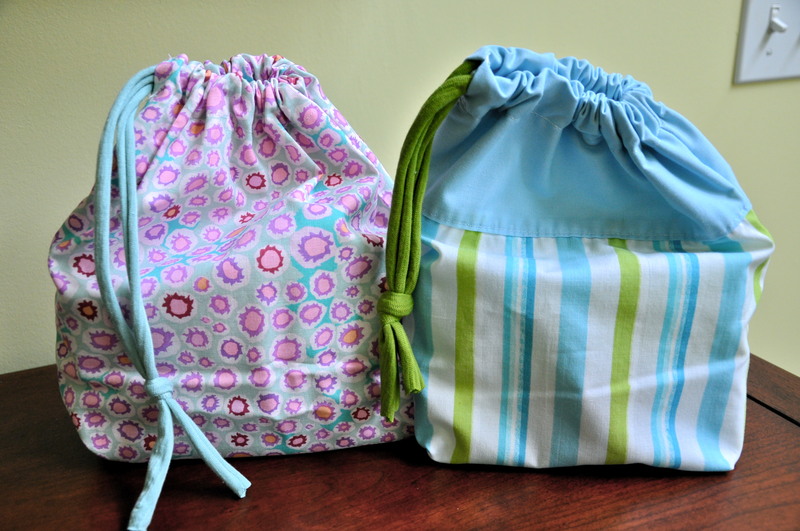 Using the above mentioned hobo sack tutorial from MADE, I made little carrying cases for the blocks. You can use any fabric you want, I went with a cotton print. MADE has a fabulous, very clear tutorial for this project, so make sure you follow what she says and not what I’m blathering on about here. BUT. 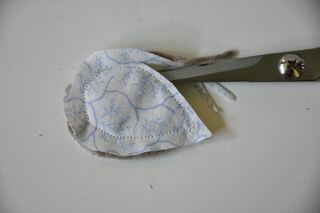 I did make one modification to make the hobo sack totally baby-proof. I was a bit worried that the ties would pull out from the hobo sacks if I made them the way that Dana did, and I didn’t want any chance of a choke hazard. God forbid. SO… I only made the little opening on ONE side of the top (she has you make two openings in the casing… I just made one) and I pulled only one drawstring through. Then, instead of tying each end into a knot, I tied *both* of the drawstrings *together* so that there is no way they could be pulled out. They make one continuous loop. You can see what I mean in the picture. 10. Take pictures of the product and post it back to me so I can see your fabulous results!